Don't we always need guy cards? This week's color challenge at Splitcoast had a desert option for woodgrain. I decided not to do the color challenge but still liked the idea of using my Hero Arts Woodgrain block along with some other tree themed stamps. 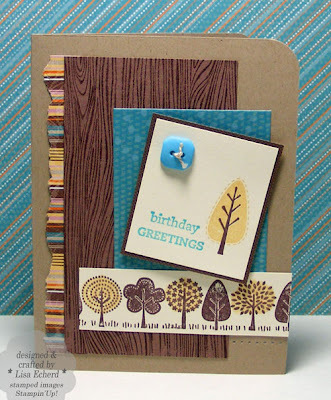 The colors came from the striped designer paper and the sketch is this week's sketch challenge. After I cut the woodgrain stamped paper I really wished I had torn the edges. So I added the torn strip of the inspiring stripe paper. I adjusted the layering from the sketch just a little to put the stamped strip on top of the turquoise layer. A little paper piecing helped balance a slightly top heavy layout.